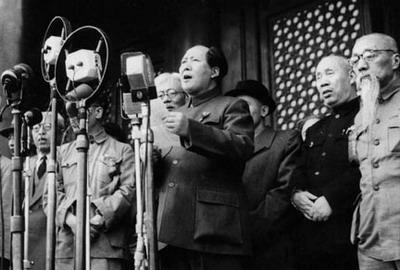 English: Pictured here is former Chinese Chairman Mao Zedong announcing the founding of the People's Republic of China on October 1 1949. También debes incluir una etiqueta de dominio público de los Estados Unidos para indicar por qué esta obra está en el dominio público en los Estados Unidos. Note that this work might not be in the public domain in countries that do not apply the rule of the shorter term and have copyright terms longer than life of the author plus 50 years. In particular, Mexico is 100 years, Jamaica is 95 years, Colombia is 80 years, Guatemala and Samoa are 75 years, Switzerland and the United States are 70 years, and Venezuela is 60 years. 20:06 22 oct 2018 414 × 279 (23 KB) Mr. James Dimsey Good and batter image.